While watching TV awhile ago, I saw a cooking show using lentils and pasta. Nice idea. I looked around and realized that I had bought some yellow lentils the other day, I just didn’t have a plan for them. Now I did. This dish came from part inspiration and part TV cooking show. Of course, it’s GF, as always. But these days I’m trying to use more ingredients that are good for you with protein, vitamins, etc. I think it’s important to try and eat as healthy as possible these days, why not give your body a boost? I looked in the fridge and came up with a plan, pasta with lentils, tomatoes, onions and greens. Not only would this be good for you, but it had to be tasty as well with all these good things. One thing I learned from my friend Linda many years ago was to use bagged salad for other things. She made a wonderful pasta dish using just caramelized onions, leeks and a bag of mixed greens for salad. They add a great texture and flavor. And it’s a quick thing to add to any pasta dish for a bit of color and pizazz. The name Confetti Pasta came from my husband, who remarked how beautiful it was. He then ate a bowl of it and said it was the best thing I’d cooked for him. He gave it a 9 because, as he explained, if he gave it a 10 I would get a big head. Isn’t he precious? I love this dish because it’s so beautiful, colorful and inviting. Of course, as always, feel free to improvise with anything else you have in the house. Add any veggies you want. It’s already a rainbow of colors, adding zucchini or eggplant would just add to the colors, or even sun-dried tomatoes or roasted red peppers. 1 bunch of greens, chopped. I use 1/2 a bag of baby greens with arugula, spinach, etc. 1. Start water to boil for pasta. When water boils, cook as directed. Be careful with the penne, it tends to stick together when you first put it in the water. Make sure to salt the water well and stir for the first minute or so. I also add some olive oil to the water to make it less sticky. 2. Add lentils to water and broth in a separate pot and simmer for about 20 minutes. Check for doneness at 20 minutes and decide if you need more time. Also, keep some water handy in case you need to add more as the lentils cook. 3. Heat about 2 Tbs olive oil in a large (very large) skillet. Add onions and a pinch of salt and sweat (covered) for about 15 minutes, then cook uncovered over low heat for another 15 minutes until they begin to carmelize. 4. Add chopped tomatoes, garlic powder, basil and salt and pepper to onions. Let these cook over low heat while you wait for the pasta and lentils to finish. 5. Drain lentils and pour into onion, tomato mixture. Toss gently, careful not to break the lentils. 6. Drain pasta just at al dente. Rinse quickly with cold water (I find this keeps the GF pasta from getting mushy). 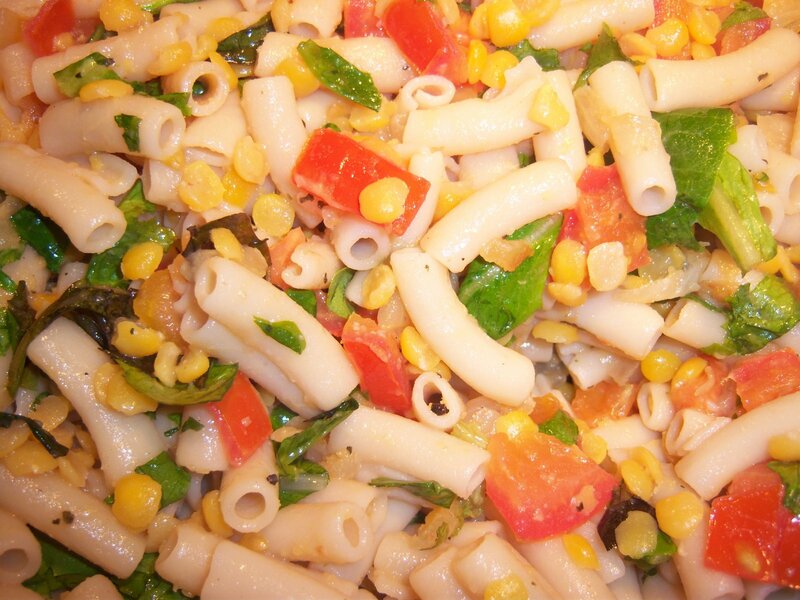 Add pasta to pan with veggies and mix. Pan is getting full now, so mix slowly. 7. Finally, turn off the heat and throw the greens on top and mix gently. The heat from the pasta and veggies will wilt the greens just right. 8. Serve with shredded Romano cheese and red pepper flakes. I may be handy in the kitchen, but sometimes, especially when it’s 110 degrees, I just can’t fire up the stove. It’s so hot it drives me nuts. But my daughter and I have found a few great places to nosh this summer without breaking the bank or using too much gas. The first place we love is PieZano’s pizza place in the Town and Country shopping center. Located at 20th St. and Camelback Rd., it’s pretty centrally located. This small restaurant tucked behind Trader Joe’s (another one of my favorites, but that’s another story) lets you build your own personal pizza. We like to call it the Pizza Subway. And even better, they carry GF pizza crust. If you ask for the GF crust, right away the server changes his gloves and reaches for a special cooking tray. After the toppings are added (they’ll tell you what is GF or not, but most things are) it’s run through an oven on it’s own tray so it doesn’t touch the bottom where gluten has been. They even have a specially designated slicer for the GF pizzas. Now that’s what I call service. PieZano’s also carries GF Redbridge beer and GF brownies, although they are a little pricey for the small brownie you get. Wed. nights are GF nights with free brownie and $2 GF beer, more than enough reason to give it a try. Picazzo’s is a much more elegant type of eatery than PieZano’s but just as good. There are a few of them dotted around the Valley, but we mainly hit the one on Scottsdale Rd. and Gainey Ranch. There is another one in Tempe off the I-10 if you’re down that way. Picazzo’s has an incredible GF menu featuring pizza, foccaccia bread, dips, etc. Most everything can be made GF and it’s worth it. The pizza tastes closest to real pizza, although a bit drier than PieZano’s. The advantage to this one is that you can get an entire pizza. And the toppings are numerous. But, you will pay for this treat. Most GF pizzas will run you about $20 for a regular pizza, nothing special. When you pile on the toppings, you may need a second mortgage. But if anything, you must visit Picazzo’s for dessert. A warm, half-cooked GF chocolate-chip cookie in a skillet topped with vanilla ice cream. It’s amazing, and tastes more like a real chocolate-chip cookie than I have ever come across. I think I just like eating that, it’s my favorite and worth the trip just for that, trust me. They also have a brownie along the same lines, but try the cookie, it rocks. I’ll get a photo of the next one I eat. Don’t laugh, if I’m looking for a quick meal that’s GF, it’s hard to find. Ever been driving around and think you’d love to hit a fast-food joint? Being vegetarian and GF cuts those options down to one. But, the bean tostada or the crunchy taco (with beans instead of meat) are GF and quite satisfying. My daughter and I share a #8 (three tacos) and it’s just enough, and it definitely won’t eat too far into your wallet. Plus, without all the cheese and meat and fried tortillas, it’s not so bad for you either. You can find Taco Bell anywhere, of course. Just remember to check the web site or ask if you’re not sure. Of course, soft tacos and burritos are out of the equation, and I believe when I last checked the potatoes were not GF either. Tucked away in the Albertson’s shopping center at Thomas and Scottsdale roads is a great little Vietnamese restaurant. While in there one day, I spoke to the owner and asked about GF food. He was very accomodating and made a great GF/vegetarian rice noodle dish. It is just wonderful. It has veggies, tofu, and rice noodles in a great sauce made with GF soy sauce he keeps in the back. I’ve been back a few times and I’m never disappointed. Give it a try. They also have fried rice that can be made GF and it’s great with tofu also. Well, that’s a few for now. I’m getting hungry. I had leftover noodles with sun-dried tomatoes, Roma tomatoes and garlic for breakfast. Yum! That will keep me going for the morning, but I’m getting hungry just thinking about all this great food. Let me know if you have any places in town you love. I’d love to give them a try. I love the way basil grows, it looks so beautiful and bushy and smells wonderful. Every year, I plant a new one and watch it grow. My daughter uses it for her food, I use it as much as possible, but I hate to pick at it it since it’s so pretty. Well, right now it’s large and overgrown in the back yard. Today it was about 113 degrees out here in the desert, and this plant won’t last much longer, even in the shade of the orange tree where it sits. 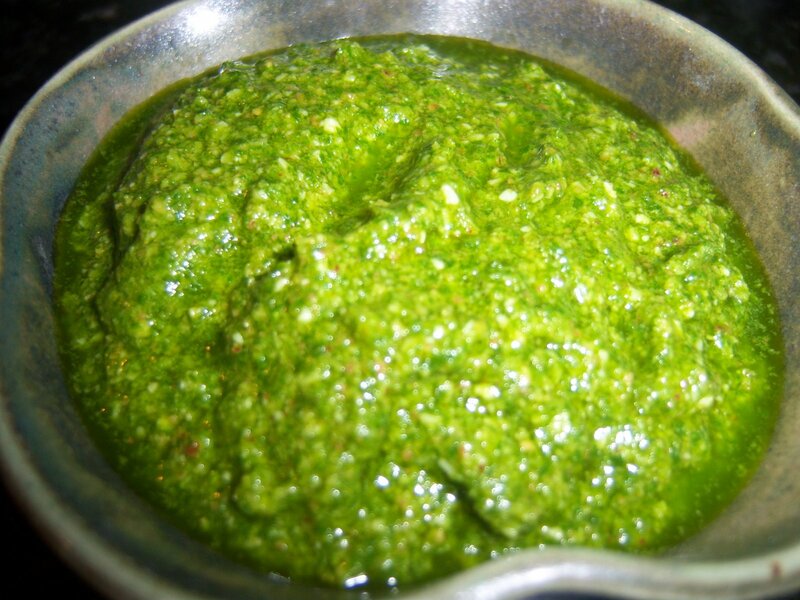 So if you have all that basil…we all know what that means… pesto! I grabbed a huge handful of leaves from the plant this afternoon and headed into the kitchen. Just the aroma of the leaves is intoxicating and I’ve said more than once that I would love a perfume with basil in it. It smells so sweet and earthy. But, I digress. I gathered all my ingredients, most of which are always in the house such as garlic, olive oil, Romano cheese, salt, etc. But I was missing one of the key ingredients–pine nuts. I’ve read that some people make their pesto with walnuts, so I figured I’d use something else also. All I could find was a bag of candied pecans from Trader Joe’s. I know it sounds crazy, but I used them and it was so amazingly tasty. I’m going to use them from now one, that’s how good it was. It gave the pesto a wonderful, sweet but tangy flavor. If you don’t happen to have any candied pecans in the house, go ahead and try any kind of nut in the house. Pesto has that wonderful versatility and can be used in so many ways. Over grilled veggies, over pasta (of course), on pizza, on toast (gf of course) and more. Go ahead and give this a try. And if you try anything different, let me know. I’m always looking to try something new. This is the pesto on it’s own. I just love the vibrant green color and the aroma is fantastic. I could just eat it with a spoon (and I do). 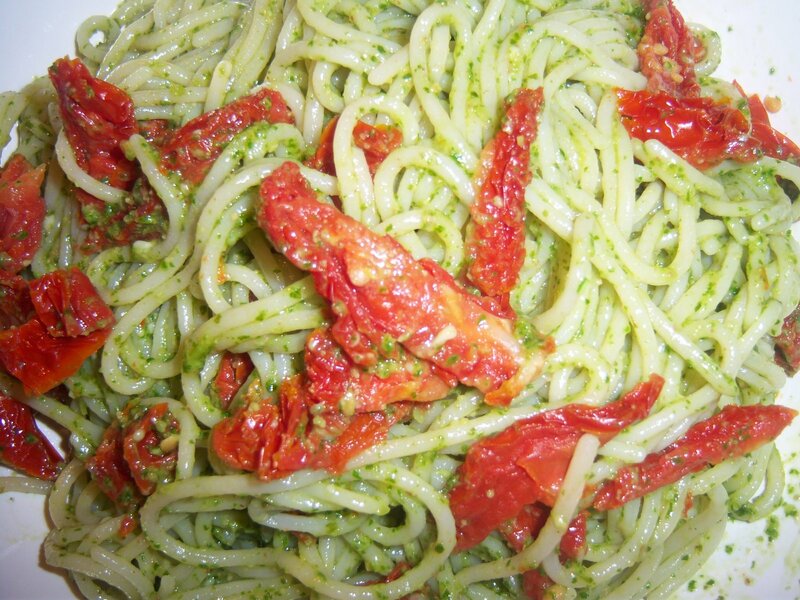 This is my pasta with the pesto and sun-dried tomatoes. Too yummy for words. The only way to find out if something works is to give it a try. I’ve made a few mistakes, but I’ve also discovered some pretty great dishes too. I’ve put the recipe I used below, but go ahead and use more of less of anything to suit your taste. The recipe calls for one large clove of garlic, but if you like more, go for it. If you like less, I’d say just use one small, or just 1/2 of one. I like a lot of garlic and not so much cheese. 1. Put garlic, nuts and salt in food processor and blend. 2. Add basil and cheese, then blend a few pulses to get all the basil blended. 3. Add olive oil slowly to get the consistency you like. You may not need to use all the oil, or you may need more. I like mine pretty thick. 4. Done! It’s that simple. To serve with pasta, just add pesto to cooked pasta and stir. I added a few sun-dried tomatoes in the pasta water for the last 2 minutes to soften them up, then mixed them all together with the pesto. Yum. You can add a little more shredded cheese if you like. Alas, that was many years ago and many miles ago. I’m living in the Valley of the Sun now, I’ve been a vegetarian for 22 years and gluten free for the past three years. That pretty much leaves out any more pasta/seafood Christmas Eve dinners. But Mom lives in the Valley now also, and is living GF too. Although I’ll never have calamari pasta again, the search for a good GF pasta is finally over. I’ve finally decided on a brand that actually tastes like the pasta I remember. Of course, nothing will ever compare exactly to a good, semolina pasta. As I’ve said before, I refuse to eat something that doesn’t wow me, and in my quest for pasta, I wasn’t wowed for a long time. I tried Tinkyada’s brown-rice pasta and it was pretty good, it just had a tendency to get mushy very fast and it doesn’t have much flavor. I tried corn pasta that I found at Safeway one day (I don’t even remember the brand) and it was totally inedible. I think I could do some yard repair with that stuff. Finally, someone mentioned Trader Joe’s brown-rice pasta. It’s much less expensive than the other brands, and believe it or not, it’s great!… The pasta cooks up nicely and has a wonderful al-dente texture, just like whole-wheat pasta. It actually has a great taste that adds to the flavor of any dish. I prefer to use the spaghetti-style pasta, but they do have smaller noodles also. 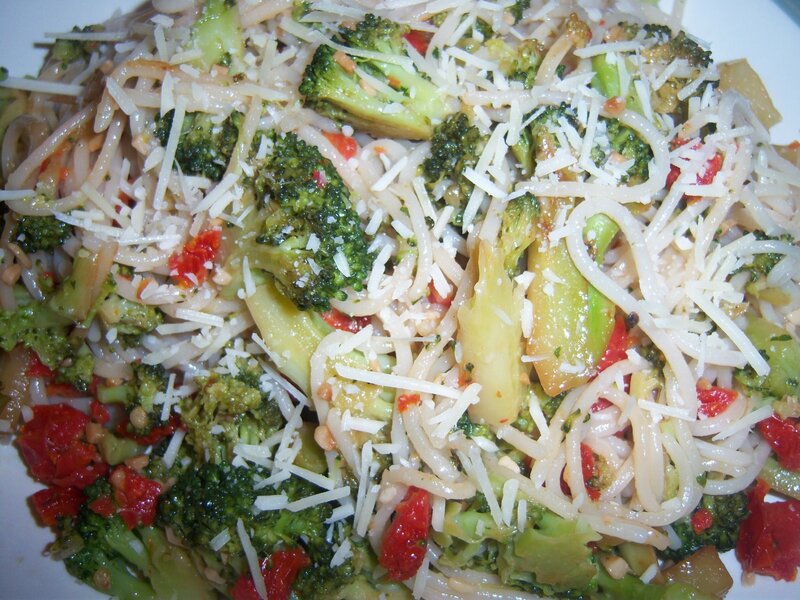 Tonight, my daughter requested one of her favorites for dinner–broccoli and garlic noodles. Before GF, we ate them often. After, I would just make them for her and watch her eat them. Now that I’ve finally found a pasta with great flavor and texture, it’s time to head back. Since she’s not a big fan of sun-dried tomatoes, I just take her serving out of the pan before adding the tomatoes. But if you’re good with everything, just follow the directions below. And thanks Mom for the great Christmas Eve memories. Drop pasta into large pot of boiling water for approximately 10 minutes. While pasta is cooking, put broccoli in a large sautee pan with about 1/3 cup water. Cover and steam broccoli for about 5 minutes or until tender. Remove cover and let water cook off. Add olive oil, garlic, tamari and sun-dried tomatoes to sautee pan and cook over medium heat for about 5 minutes until garlic is slightly browned. Add salt, pepper and red pepper flakes. Strain pasta and rinse with cold water for 10 seconds. Let drain and add pasta to sautee pan and toss everything together.